Have you solved the problem of the appearance of blank fields on the Auto-responders? Blank fields are not displayed on the "Notifications" we received after one of our forms is completed, while ALL fields (blank or filled-out) appear on the "Autoresponder" that the customer receives. In 2011, Aytekin indicated that there was not solution yet to this problem. Others made some other suggestions. Can we, somehow, apply the same procedure that you use in the "Notifications" to hide the blank fields in the "Autoresponders"? How do you do it in the "Notifications"? I am sorry if I am not sure if I am able to understand your inquiry properly, --but from what I understand, you wanted the unanswered fields not to show in the autoresponder emails? Our colleague Mike_T had a suggestion on similar inquiry before (check for it on this thread). You can apply the suggestion in the autoresponder email of the form. Please inform us if this works for you or not..
After further checking I noticed that your forms autoresponder email template is somehow lacking some of the fields that are in the form -- example, like the matrix fields. So, when your form is submitted, it is not able to include the information from the matrix fields. You maw want to review your form's notification and autoresponder email. To restore the email templates, you can also just add a new email by using the Add New Email button. You can also test my cloned form http://www.jotformpro.com/form/30217055841952 . 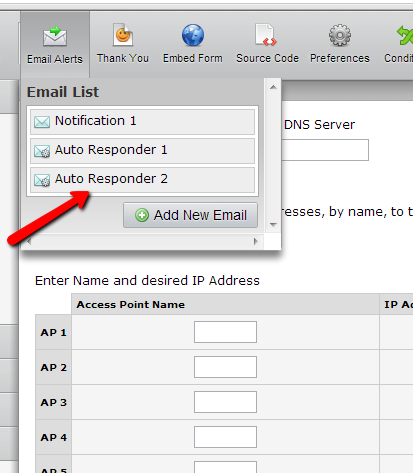 Provide your email address in the E-mail field to get the autoresponder email. Thank you, Jonathan for looking into this issue. I will certainly correct the emails with missing fields. I visited the thread you indicated and I thought that the "Auto Hide Empty Fields" would accomplish the task, but I cannot find what is called there "Submissions Page". Where is that page? Here's how to go into your submission page. 3. Click "Submissions" button and you'll be redirected in to your submission page. Thank you, pinoytech. I located the "submissions" page and was able to successfully customize and forward emails. Nevertheless, after about 3 test emails, I couldn't send any more and I received a message saying that I had "reached my limit". I know that you set a limit to avoid the spamming that would otherwise occur, but once these forms are in productions I may need to forward emails more frequently, at least during peak-hour. I will have to copy the html code and paste it directly in my email client to send all the email I need to send. This might be my solution. Thanks. It's my pleasure mmunguia. If you need our assistance again, feel free to contact us at anytime. Thank you for using JotForm and have a great day!